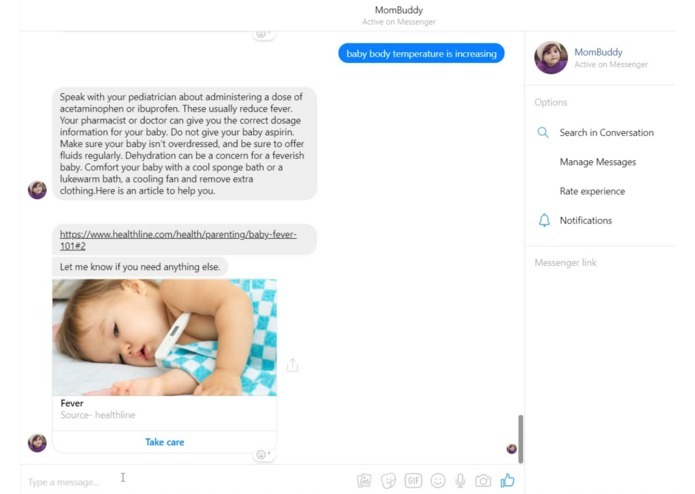 MomBuddy is a platform that makes the life of a to be mom or a new mother really easy. It can perform a range of different tasks. They are: Talking to the mother when she’s going through something and probably is hesitant to talk about it to someone. Helping her understand things she’s going through even when she is unable to understand it herself. Prompting her to visit a doctor when it seems necessary and if she’s shy to do so. Helping her book an appointment when she has made up her mind. Answering her general baby related queries like fever,rashes,cold etc. 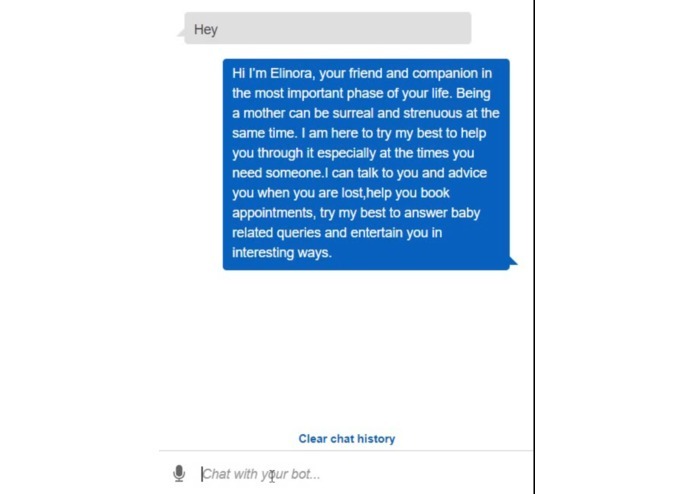 Entertaining her in interesting ways like letting her play a game on the bot which predicts her sentiment and makes her feel understood and entertained at the same time. It’s a little addictive really! We used AWS Lex to build the chatbot specifically intents,utterances,slots,response cards etc. We categorised the most prominent and common issues amongst new or to be mothers into segregated intents with specific and relative utterances. The intents contain response cards and slots that cater to the user’s input and fulfill a task if required. The chatbot also contains aspects like booking an appointment and the interactive UI. 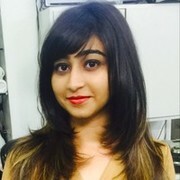 The AWS Comprehend was used to build the game aspect of the project that predicts sentiments. AWS Lambda was used to respond to certain events like when user wants to play a game and enters a statement for sentiment analysis. 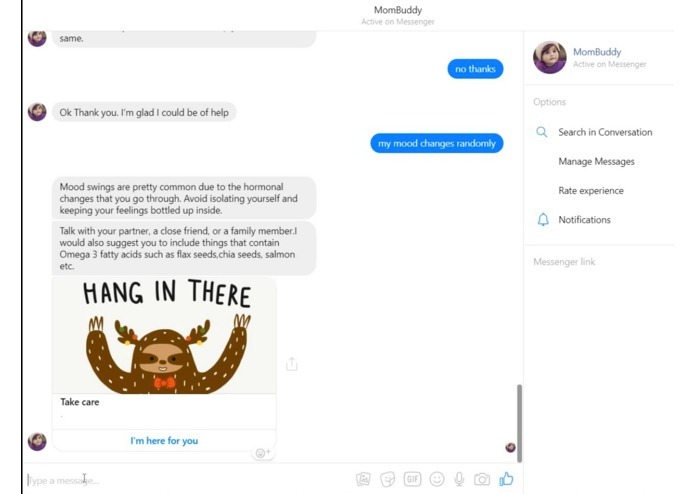 Finally, Facebook was used to deploy MomBuddy. 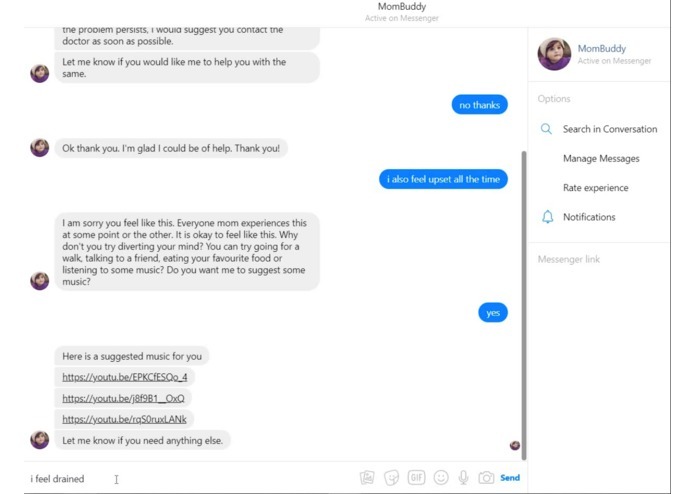 We ran into a few challenges like making the bot interactive since the response cards used to not show up at times and we had to try our best to make use of the functionality of response cards for our use case. We also faced challenges related to integration of Lex with other Amazon services like Comprehend and Polly since we were trying to figure out what were the limitations of their integration and what boundaries can be pushed. Lastly, we did encounter issues when trying to get information to the bot dynamically. We are really proud of the fact that we could identify such an underestimated and shadowed problem in society that so many people face yet it goes unspoken about. It is a crucial topic because two lives depend on it. We are proud of the simple but concentrated uses of our bot and also the way we tried to make it fun. Lastly we are proud of the interesting and diverse integration of Lex and Comprehend. We learned a wide array of things like how Lex works wonderfully and simply along with it’s limitations. Also how Lambda can do amazing things that are otherwise probably difficult to achieve in a straightforward manner and how Lex integrates with Comprehend. 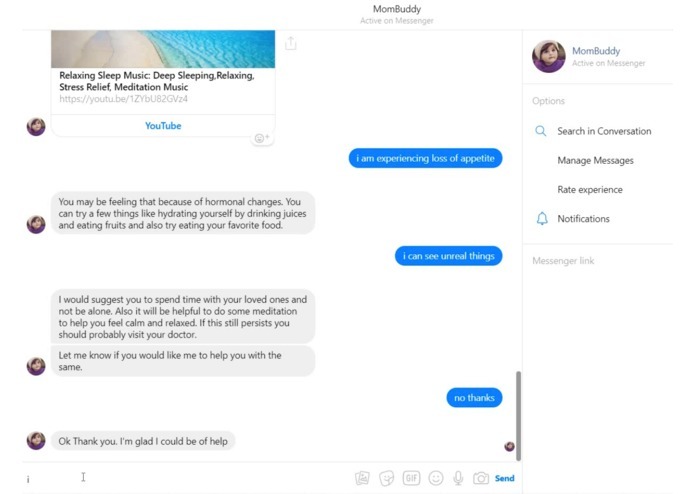 Presently MomBuddy can be used by women stepping into or new to motherhood. But in the near future after it’s functionalities are improved, it can probably be used by doctors who want to understand things from their patients perspective and also for research purposes and analysis. 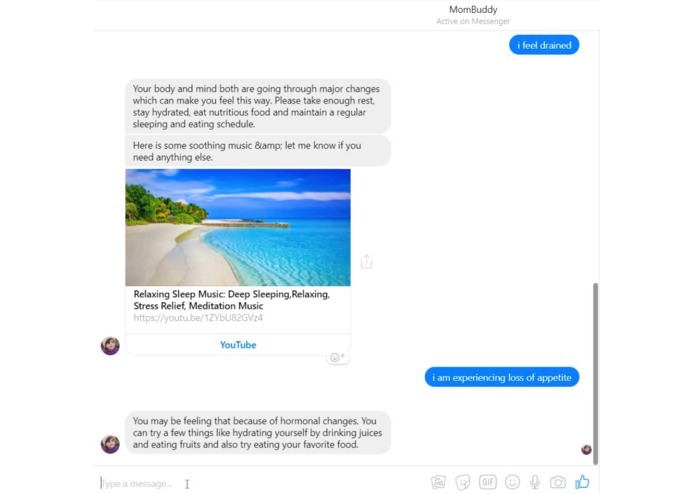 Lex connection with Facebook messenger. 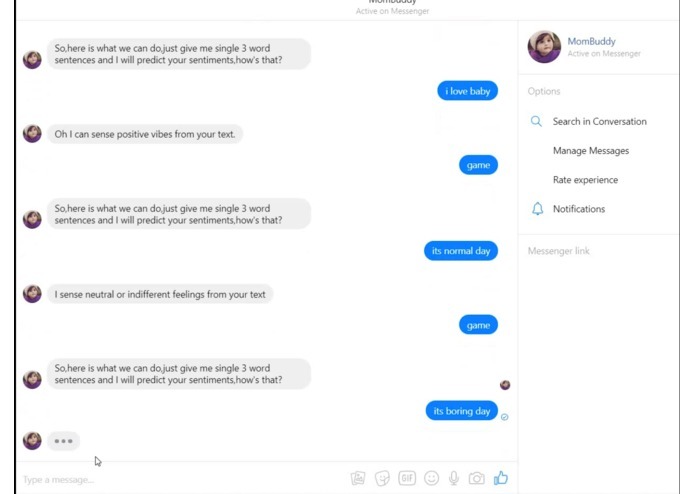 - test cases for the dialogue flow in messenger.